Dinosaurs hatched from eggs, like their bird descendants and most living reptiles. Hundreds of dinosaur egg sites have been discovered; three-quarters of these are in North America and Asia. Most of the sites that have been found date from the Late Cretaceous Epoch, and many are associated with hadrosaurs. Knowledge of the lifestyle and behavior of ornithopod dinosaurs has been greatly enriched by the discovery of their fossilized eggs, nests, and young. This is largely due to the pioneering work of paleontologist John "Jack" Horner (b. 1946) of the Museum of the Rockies in Montana. Together with his students and colleagues from Montana State University, Horner has spent much of the past 30 years studying the stunning remains of eggs, nests, and skeletons found at numerous fossil sites in northwestern Montana. We know from these discoveries that at least some kinds of orni-thopods nested in colonies and probably took care of their young until they were able to leave the nest on their own. Many of these eggs and nests belonged to Maiasaura, so-named "good mother lizard" because of evidence that these duckbill dinosaurs cared for their young. Their behavior is strikingly similar to that in modern birds. From 1978 to 1983, Horner and his colleagues unearthed a bonanza of Maiasaura eggs and babies. Dating from about 80 million years ago in the Late Cretaceous Epoch, the team had discovered three nesting sites collectively consisting of 14 nests, 42 eggs, and 31 babies. 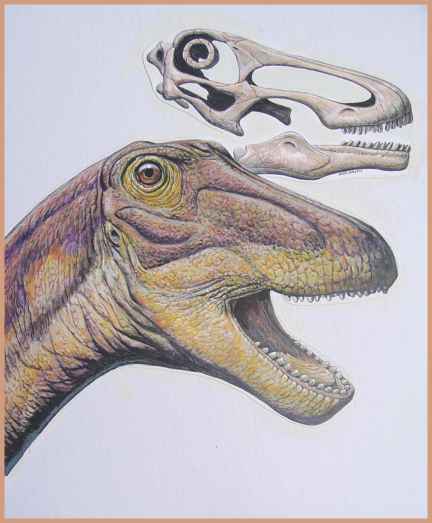 Larger specimens of Maiasaura at various stages of growth were also found. After "discovering" a coffee can full of baby dinosaur bones in a small Montana rock shop in 1978, Horner and his team went into the field to locate more evidence of these dinosaurs. The first dig resulted in the discovery of a hadrosaur nest with the remains of 15 three-foot-long (0.9 m) duck-billed dinosaurs still inside. The work of a few days expanded steadily over the course of a few years as the team continued to discover nests, eggs, and the remains of hadro-saurs of different sizes. The eggs were laid in bowl-shaped nests about 6.5 feet (2 meters) across and 2.5 feet (0.75 m) deep. An adult hadrosaur—most likely the mother—may have dug out the nest in mud with her hind feet and shaped it into a mound with her forelimbs and muzzle. The hollowed-out mound of mud was then covered with vegetation such as pine needles to protect and incubate the eggs. There were up to 20 eggs per nest. Most puzzling was the fact that the eggs were always found in tiny fragments and with no obvious pattern to their arrangement. It was as if they had been trampled underfoot repeatedly for a long period of time, which is exactly what Horner concluded. This became obvious when the scientists took a close look at the bones of the babies that were found in the nest. The baby dinosaurs found were sometimes up to 3 feet (0.9 m) long. Horner noted two intriguing features of the skeletons that have been interpreted in different ways. 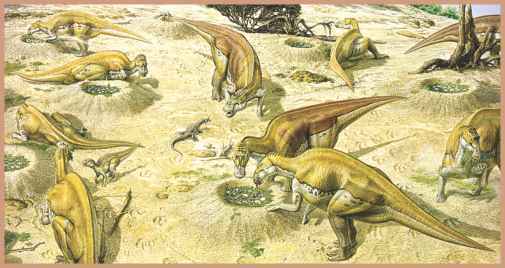 The teeth of the young were well worn but the joints in their legs were weak, suggesting to Horner that the baby dinosaurs were eating but were not capable of leaving the nest to fend for themselves. It became apparent to Horner that the hadrosaur babies remained in the nest for an extended period, perhaps as long as eight or nine months. The implication is that an adult dinosaur was looking out for the well being of the babies. Horner pictured an adult dinosaur looking over the nest, protecting the babies from predators, and bringing food for them to eat, in the same fashion that birds care for their young. The reason why crushed eggshells littered the floor of the nest also seemed obvious, for that's what would happen if baby dinosaurs were trampling them for months at a time. Fossil nesting sites reveal possible parental behavior of Maiasaura. Horner's portrait of hadrosaur family life was made even more compelling by the fact that the nests themselves were part of a larger nesting ground. The nests were spaced about 23 feet (6.9 m) apart, which is about equal to the estimated average length of an adult Maiasaura. This suggested that the dinosaurs nested together and made room for an entire herd in a manner similar to bird colonies today. Horner's team also found several deposits of nests and eggs in different layers of rock at the same site, strongly suggesting that the dinosaurs returned to the same spot to lay their eggs more than once. This led Horner to picture a large herd of migrating Maiasaura, perhaps 10,000 strong, making their way back to the same nesting grounds year after year. Horner's interpretation of the Maiasaura evidence was not accepted by all. Because no Maiasaura embryo has yet been found inside an intact fossil egg, some believe that some of Horner's tiniest "hatchlings" may actually be unhatched embryos. This would explain their extremely small size and undeveloped leg joints. Even the evidence of worn teeth in Horner's Maiasaura babies does not prove with certainty that the specimens were not embryos. Horner himself discovered the embryonic remains of another duckbill, Hypacrosaurus, that showed tooth wear prior to being hatched. What is known of eggs and nesting habits of ornithopods?